​A fresh 6.7 magnitude earthquake struck 17km south of Kodari, Nepal, on Sunday morning triggering avalanches on Mt. Everest and raising fresh fears after Saturday's 7.9 quake claimed over 3,300 lives. The US Geological Survey reported the quake struck at 1:09pm local time (7:09am GMT). The quake was followed by another tremor, of magnitude of 5, less than 20 minutes later. The earthquake triggered an avalanche in the Himalayan Mountains, as well as tremors in the Indian capital, New Delhi, more than 1000km away. The New Dehli Metro system has been halted to a standstill. The Kathmandu Airport is reportedly closed after the 6.7 earthquake struck Sunday, with airspace shut down, airlive.net reported. 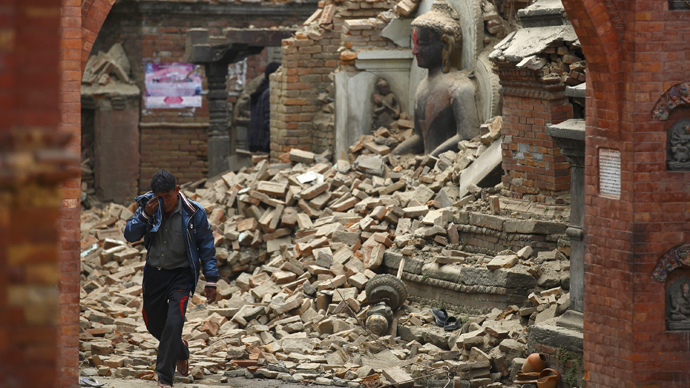 Tens of thousands fled their homes in the Kathmandu Valley after the 6.7 quake hit. Since Saturday’s tragic 7.9 earthquake, more than 30 aftershocks have been recorded. The new earthquake is 'shallow', at only 10k deep. Usually smaller-depth shakes cause less damage, but sometimes, a quake with a shallow center can cause more acute damage. AP reported the tremor as a "major aftershock," but others observed that the sheer size of the shake constitutes it as a second earthquake. People near the epicenter were yelling and running for open ground, AP said. There are so far no official reports of casualties or damage from the latest quake. Romanian climber Alex Gavan tweeted that Sunday's aftershock triggered three avalanches. "Another one, we have an aftershock right now, oh s***," Indian mountaineer Arjun Vajpai told Reuters in a phone call made from the Mount Makula basecamp, located 12 miles (19km) from Everest. Kodari, the closest town to the new earthquake, is an alpine village on the China-Nepal border that had a recorded population of 1600 in 2012. "There is no way one can forecast the intensity of aftershocks so people need to be alert for the next few days," India's chief of the state-run weather service, LS Rathore, told Reuters. The 2,900km Himalaya Mountain range was created by the collision of the Indian and Eurasian tectonic plates. The Indian plate is still moving northward, making the region a hotbed of seismic activity. Sunday’s strong earthquake hit Nepal just as doctors and aid packages arrived to the region to address the devastation from Saturday’s quake, which has so far claimed more than 3,300 lives. The 7.9 earthquake was the worst to hit the landlocked South Asian nation in more than 80 years.